Abundant game, plenty of public land, and accommodations to suit any budget make McKean County one of the top hunting destinations in the East. McKean County traditionally ranks among the leading Pennsylvania counties for white-tailed deer and black bear harvests. Four of the 15 Pennsylvania bucks ever to score over 170.0 B&C points were taken here. Some of our bears weigh more than 500 pounds. You are liable to encounter either deer or bears just about anywhere. Turkey hunting also ranks with the best, with gobblers calling from nearly every ridge during spring. Experts rate our turkeys as the most challenging anywhere. We enjoy a real mixed bag of small game. For outstanding squirrel hunting, with an interesting mix of gray, black and fox squirrels, check the oak and hickory stands close to the Allegheny Reservoir. Flush grouse from recently timbered areas, woodcocks from quaking aspen and thornapple stands, or wood ducks from hidden beaver ponds. Search for the elusive snowshoe hare in mountain laurel thickets. McKean County public lands open to hunters include 135,396 acres of Allegheny National Forest, and five state game lands with a total area of almost 25,000 acres. A considerable amount of private land is also open to hunting. 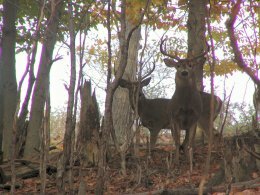 Be sure to check out the Kinzua Quality Deer Cooperative. For adventure-minded hunters, hunt out of one of the boat-access campgrounds along the eastern shore of the Allegheny reservoir. 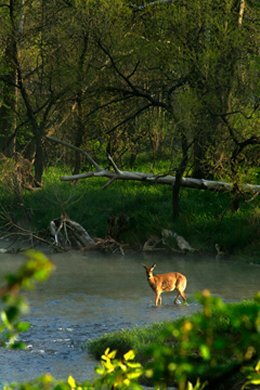 Deer, squirrel, and turkey hunting, either fall or spring, are especially good in this area. You can even combine it with fishing. You will not see many other boats on the lake during hunting season, providing a real backwoods experience.